The Irma Response project is a team of volunteers working together to make information available during and after the storm. There is a huge amount of information out there, on many different websites. The Irma API is an attempt to gather key information in one place, verify it and publish it in a reuseable way. It currently powers the irmashelters.org website. To aid this effort, I built a collection of screen scrapers that pull data from a number of different websites and APIs. That data is then stored in a Git repository, providing a clear history of changes made to the various sources that are being tracked. 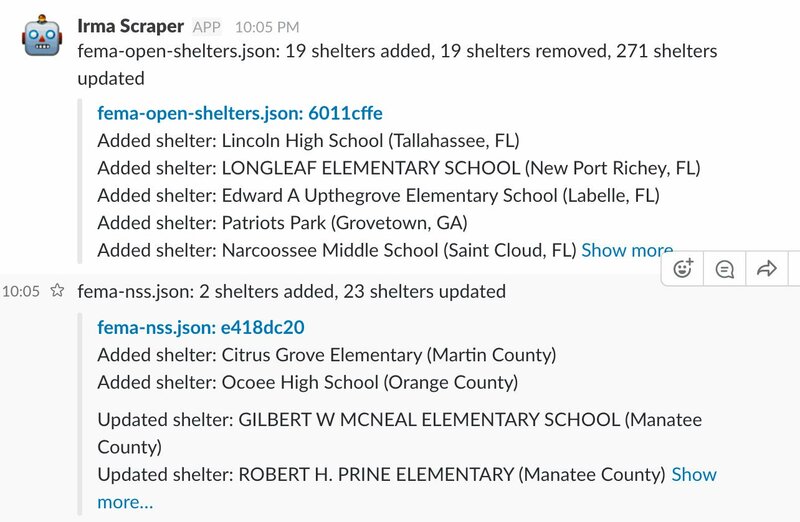 Some of the scrapers also publish their findings to Slack in a format designed to make it obvious when key events happen, such as new shelters being added or removed from public listings. A key goal of this screen scraping mechanism is to allow changes to the underlying data sources to be tracked over time. This is achieved using git, via the GitHub API. Each scraper pulls down data from a source (an API or a website) and reformats that data into a sanitized JSON format. That JSON is then written to the git repository. If the data has changed since the last time the scraper ran, those changes will be captured by git and made available in the commit log. The full commit also shows the changes to the underlying JSON, but the human-readable message provides enough information that people who are not JSON-literate programmers can still derive value from the commit. Some of the scrapers publish detected changes in their data source to Slack, as links to the commits generated for each change. The human-readable message is posted directly to the channel. This Entry started out as README file. This is Scraping hurricane Irma by Simon Willison, posted on 10th September 2017.